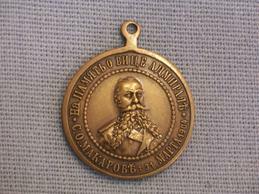 You are looking at a commemorative jetton/medal which was made in 1904 by the veterans of the Pacific Fleet to commemorate the tragic death of Vice Admiral Makarov. The obverse of the jetton shows the truncated bust of Admiral Makarov encircled by an inscription meaning: "In Memory of Vice Admiral Makarov March 31, 1904". 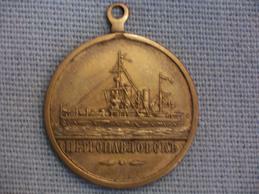 The reverse of the jetton shows a battleship with the inscription: "Petropavlosk".